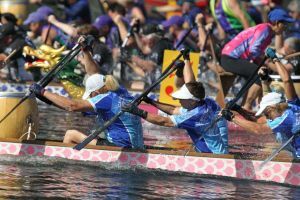 There are various positions and terms that are used in Dragon Boating – below are some you might find useful. The Steersperson / Helm, Captain of the boat. The sweep is responsible for the crews’ safety and any commands from the sweep override those from the coach. The start position, ready to start your 1st stroke. The blade of the paddle should just be touching the water. Grip the shaft of the paddle about 3cm above the paddle area. Your inside hand grips the handle on top. Rest the flat side of your paddle on the surface of the water and the shaft on the gunwale (the side of the boat). Extend your blade out away from the boat. This action helps stabilise the boat, reducing a sideways rocking motion. Also known as ‘bracing’ the boat. To be used whenever people are changing positions within the boat, when water conditions determine it, whenever the sweep commands. This allows the boat to reverse. 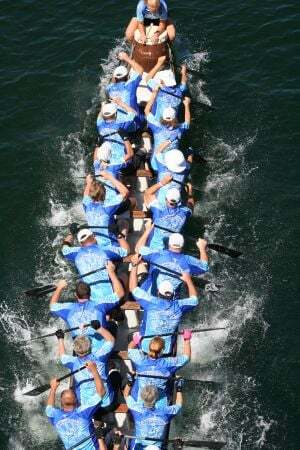 Place your paddle behind you ready to push the blade forwards in the water (towards the front of the boat) and wait. The sweep should then call “Go” so that you all start this forward stroke at the same time. As always, your timing comes from the front – keep looking forward. Generally, you need to do this when heading away from the shore, but also at the start line of a race. Push the full blade of your paddle vertically into the water to stop the boat from moving forward or backward. Stop paddling & pull your paddles out of the water.